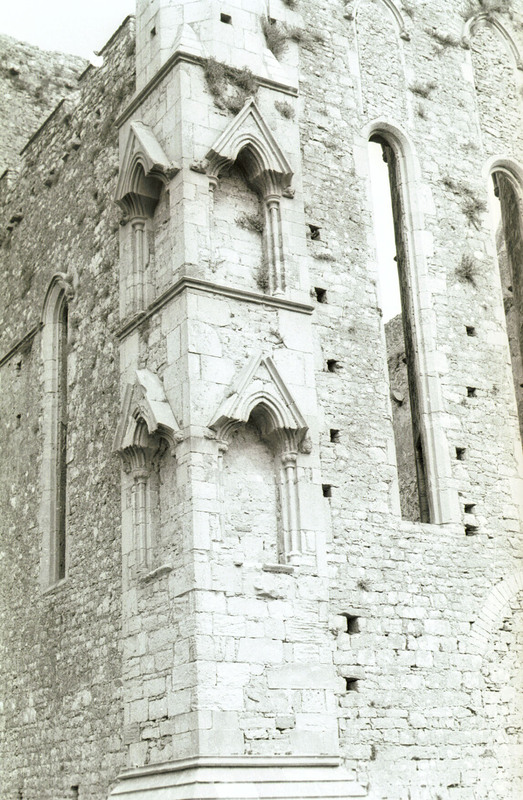 “St Patrick's Cathedral, Cashel, Co Tipperary, exterior - south transept, buttresses with gabled niches,” Gothic Past, accessed April 20, 2019, http://gothicpast.com/items/show/1184. Photograph by Roger Stalley. View of the south - west corner of the south transept showing four gabled niches in the clasping buttress bounded above and below by stringcourse. The gables terminate in head carved label stops on the upper niches and foliate label stops on the lower ones. The roll - and - fillet moulded arches are carried on filleted shafts with bell capitals on the upper niches and floriate capitals on the lower ones. One lancet window of the south and west elevations also visible.